Let's talk obsessions. There are three of mine in this outfit--and two of them you can probably guess. Wedges and necklaces. I like my wedges statement; not too high, but high enough; easy to walk in but not totally flatforms; and with some sort of extra touch that makes them different from everybody else's. With this pair, the extra touch comes in the form of polka dots. I love the retro vibe of these, plus they're easy to walk in! They're new: I picked them up off of the sale rack at Marshall's yesterday. For 16 bucks. I swear, that place has the BEST shoes for the BEST prices. Nearly all of my brand-name and stylish wedges/heels are from there!! I like my necklaces statement, too; chunky chains, neon crystals, gold collars...you get the vibe. This in particular was one I've been searching for for a very long time. 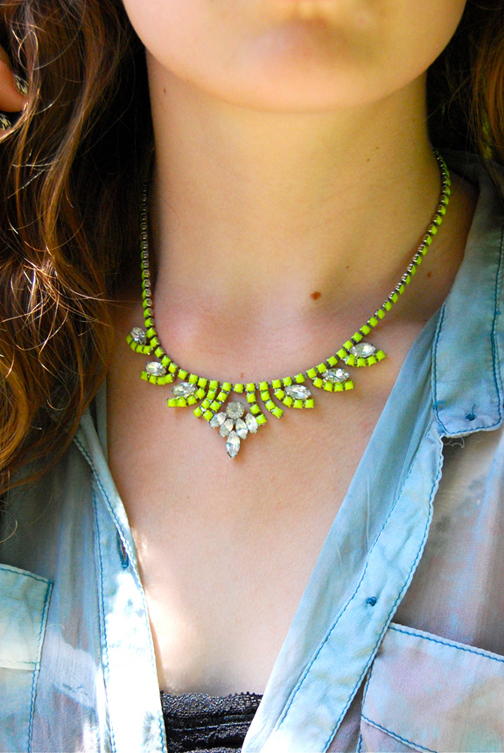 Did any of you see that green and clear H&M crystal collar necklace that hit stores back in April and May? I wanted that so so so so bad. But I never got my hands on it. So when Jessica of Marcella Leone showed me some of her unpainted necklaces, I knew that with this beauty I could get a necklace even BETTER than H&M's--handpainted, one of kind, and just mine. She custom painted this necklace just for me, with the color that I wanted!!! It came out better than I imagined--and it easily trumps H&M's :) Thank you so much, Jessica! What are your fashion (or general) obsessions? Don't forget to enter to win a feathered earcuff!!! Rory, you look undeniably cool in this post. Maybe it's the aviators, maybe it's the tie-dye, or maybe it's those polka dot wedges. But altogether this outfit is just awesome! Haha, who knew tie-dye would make such a fashionable comeback? My obsessions would be crazy, colorful shoes and statement jewelry. That skirt looks sooo good on you!! Wow. Okay I'm off to comment on the other post. What brand are the shoes? Super cute outfit!! Loving this look girl! That top and your wedges are great!